This is another completely untouched offering that came in just last week. 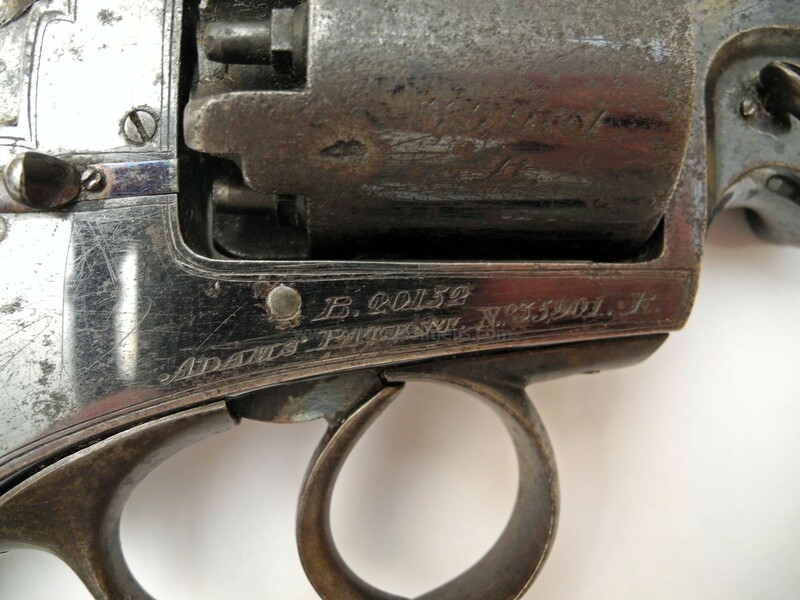 It is an English Adams revolver in 45 caliber that has never been cleaned or touched in any way, nor have the box or accessories. It is left exactly as we received it. 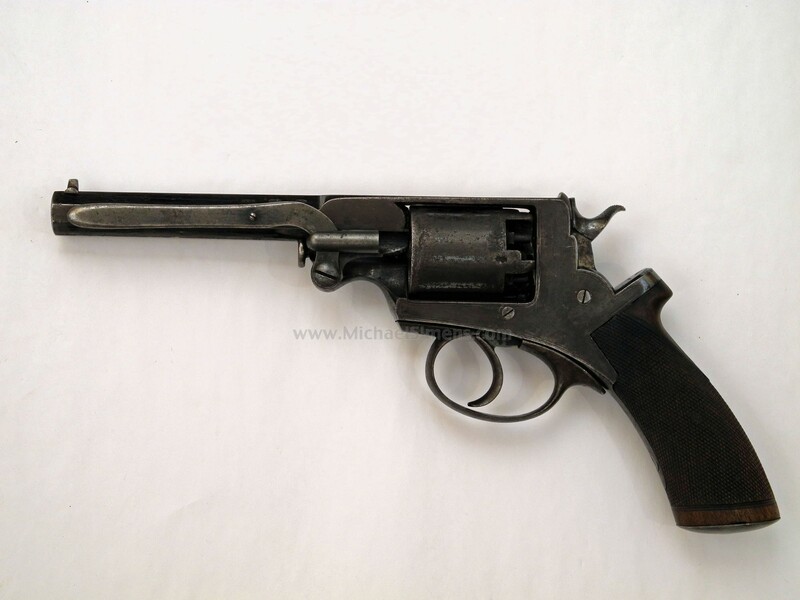 The photographs of this gun are horrible but I wanted to get them done as quickly as possible. The integral barrel and frame retain 90% very bright shiny blue. The cylinder shows about 50% bright shiny blue mixing with scattered patina and pinpoint rust with one area of slight pitting across the cylinder where it laid on its side in the case. 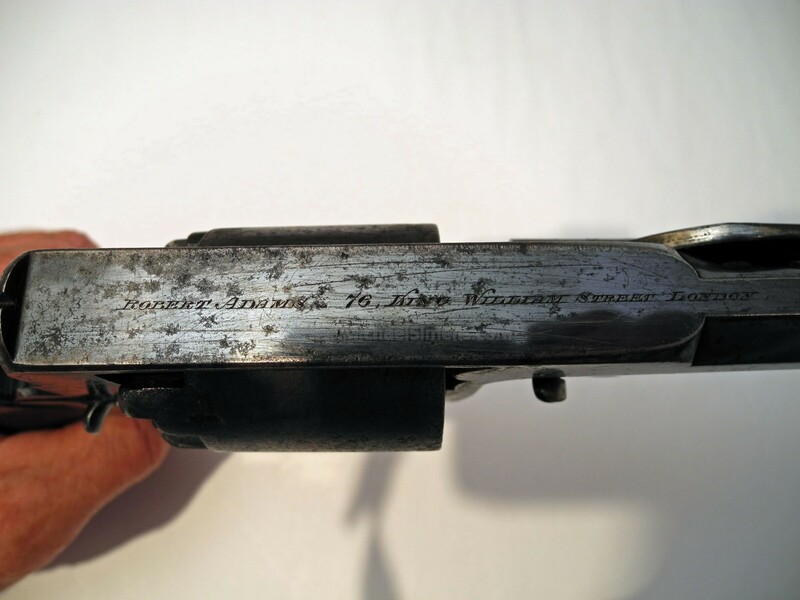 This gun shows other very minor spots of corrosion and edge wear which lead me to believe that it was holstered and carried, but well cared for. The action, edges, markings and screw heads are all excellent and the one piece walnut grips are finely checkered and in virtually perfect condition. 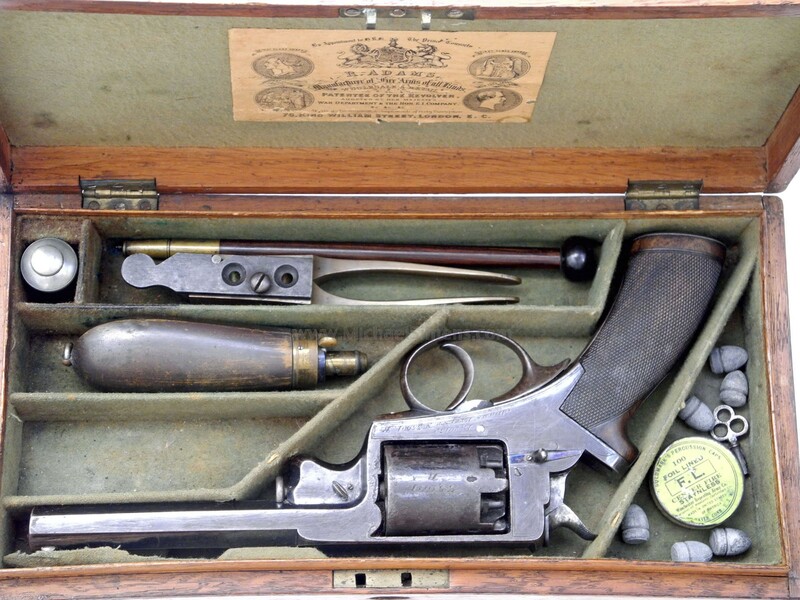 The case retains its original and near mint 54 bore marked bullet mold (44.2 caliber), a nice powder flask retaining 90% original lacquer with 100% original gold gilt on its top and spout, a tin of percussion caps, an excellent cleaning and oiler. 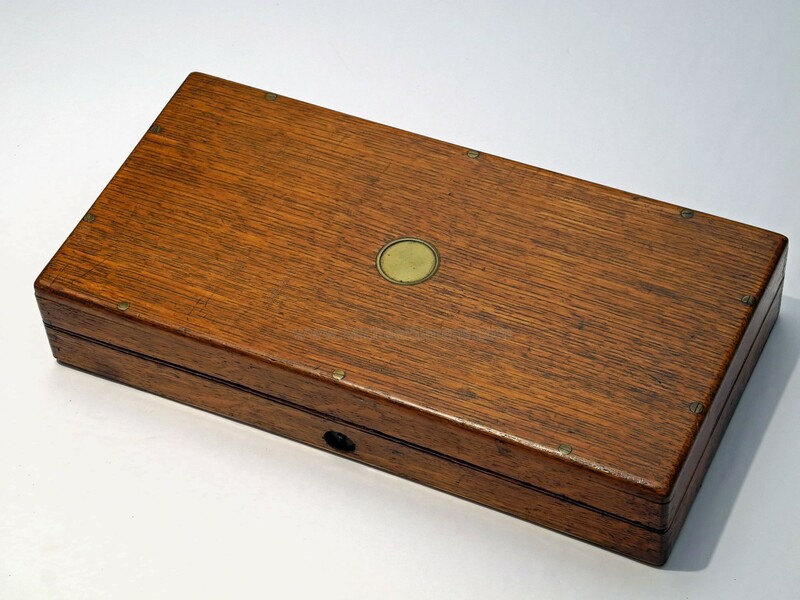 The barrel is marked with a Robert Adams address and the case retains a Robert Adams label in the lid. All in all a very fine set save for the aging of the cylinder. 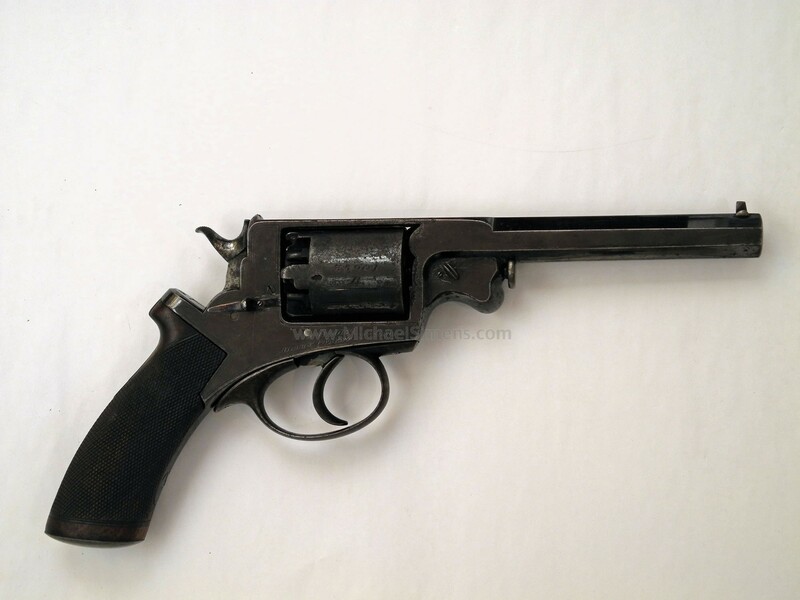 I have no doubt that this gun was carried during the Civil War and if so, probably by a Confederate Officers who cared for it in a proper manner.